It’s a series of steps that forms disciples to live out the mission of Jesus. 1) It starts with the church’s being invitational, so that anyone, Catholic or not, can be welcomed and loved. 2) And then every single person is invited to Alpha, where we hear the essential message of Christianity, the Kerygma: that God created us out of love; we’ve separated ourselves from Him by our sinful choices; Jesus comes to reconcile us to the Father; and we’re invited to respond. 3) If people are open, then they’re invited to join the Alpha Team as a helper, and so their faith deepens by going through Alpha again and by serving others! 4) Connect Groups are spiritual gatherings which meet every two weeks at someone’s house, where there’s food, prayer, and spiritual sharing. This is a person’s spiritual support system. 5) Then people are called to serve in a ministry. 6) Then in a Discipleship Group like Faith Studies. 7) And then that leads to a more fruitful worship during Mass. When people see this, they’re amazed: “Wow, I didn’t know churches actually had plans!” Everyone wants a plan, because everyone wants to grow. Plans lead to growth! Someone once asked, “How does everything we’re doing at St. Anthony’s fit together? We do Alpha, Faith Studies, etc.—what’s the plan?” I’ve known the plan for years; I’ve just never shared it. Sorry! The Gospel today shows that Jesus has a plan for spiritual growth. The Gospel’s about Jesus’ call of St. Peter, how it starts as an ordinary day and then leads to a new life and mission. The first thing we need to know by reading the Bible attentively is that this isn’t the first time St. Peter met Jesus. Jesus had already been to Peter’s house and healed his mother-in-law (By the way, some people believe that’s why St. Peter betrayed Jesus later on.) What does this tell us? It’s “within the context of an existing friendship that Jesus issues the invitation to deeper discipleship” (Daniel Mueggenborg, Come Follow Me, Year C, 121). Jesus always starts with loving us, and through loving us, He invites us to love Him in return. After starting that relationship with Peter, Jesus deepens it, and Bishop Mueggenborg of Seattle sees three steps here: 1) “While Jesus was standing beside the lake of Gennesaret, and the crowd was pressing in on him to hear the word of God, he saw two boats there at the shore of the lake… Jesus got into one of the boats, the one belonging to Simon, and asked him to put out a little way from the shore. 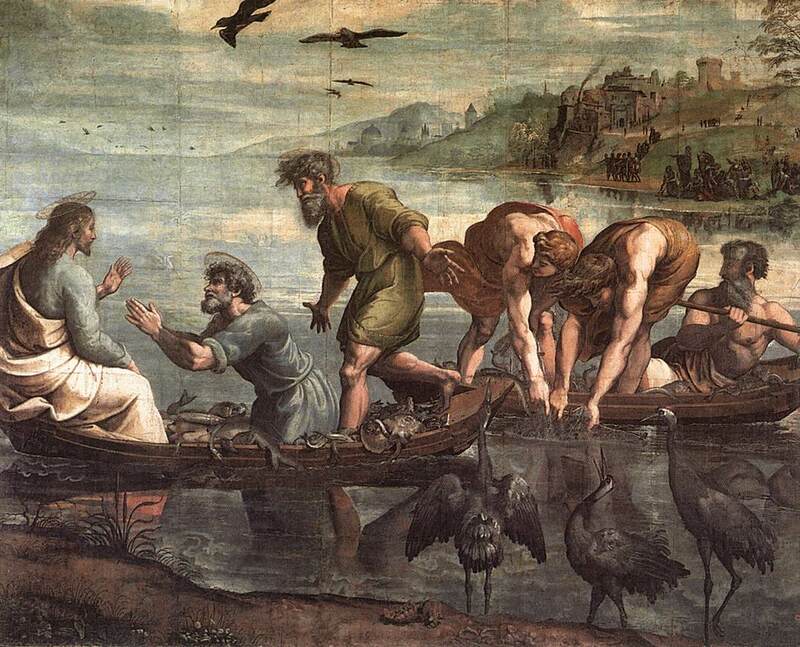 Then he sat down and taught the crowds from the boat” (Lk 5:1-3). 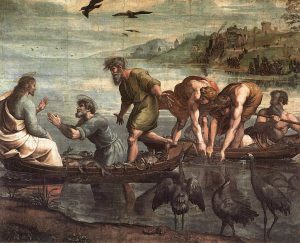 Jesus starts with an easy request of trust, that is, temporarily borrowing Peter’s boat. 2) Then He asks for more trust: “When he had finished speaking, he said to Simon, ‘Put out into the deep water and let down your nets for a catch.’ Simon answered, ‘Master, we have worked all night long but have caught nothing. Yet if you say so, I will let down the nets’” (Lk 5:4-5). Peter’s a fisherman. What’s Jesus profession? A carpenter. So Jesus is asking for greater trust , trusting a carpenter about fishing, and recognizing that the previous night’s fishing was useless. 3) “When they had done this, they caught so many fish that their nets were beginning to break… Simon Peter and all who were with him were amazed at the catch of fish that they had taken… Then Jesus said to Simon, ‘Do not be afraid; from now on you will be catching people.’ When they had brought their boats to shore, they left everything and followed Jesus” (Lk 5:6,9-11). Now Jesus asks Peter to be a disciple, to leave everything and follow Him and to help others become disciples. It started with a simple request for trust and then increased. Jesus had a plan! One famous book identified these eight principles or steps of Jesus’ forming His disciples (Robert E. Coleman, The Master Plan of Evangelism, 18-19): Selection, association, consecration, impartation, demonstration, delegation, supervision, and reproduction. So it’s our duty to discern His plan for us. And here it is: There are two parts to it: 1) Our Weekly Bread; 2) The Formation Loop. 1) The Weekly Bread consists of Sunday Mass, Eucharistic Adoration, and Confession. These are foundational habits of our spiritual life. We all have weekly habits that keep us healthy, such as exercise, time with family and friends, maybe showering. The Weekly Bread involves the sacraments, where we meet Christ in the most real way. 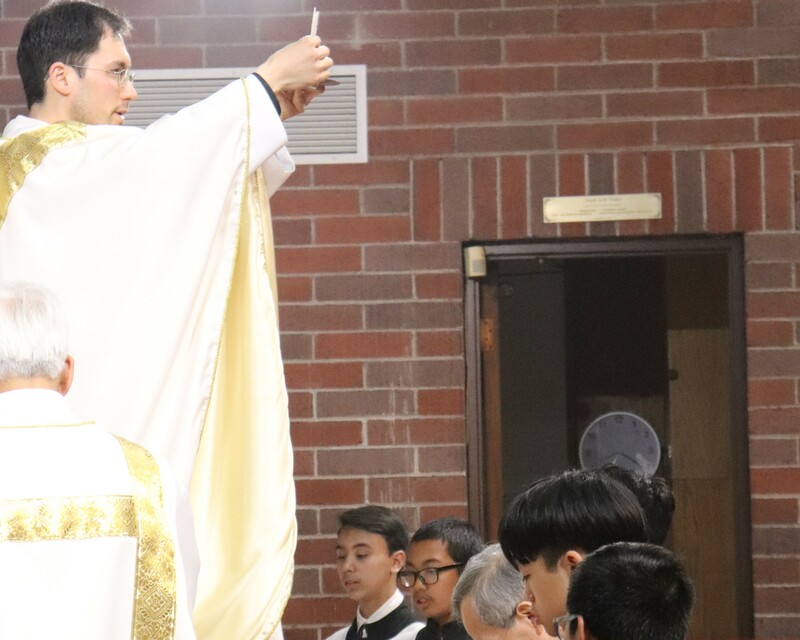 The Church teaches that “the Eucharist is ‘the source and summit of the Christian life.’ [The Eucharist is where we get our life and strength; it’s also the high point because it’s the closest we can come to Jesus here on earth.] ‘The other sacraments, and indeed all ecclesiastical [i.e., Church] ministries and works of the apostolate… are oriented toward it. [Everything we do, baptisms, pancake breakfasts, the school, evangelization, etc. is meant to lead us to Jesus in the Eucharist. Why?] For in the blessed Eucharist is contained the whole spiritual good of the Church, namely Christ himself” (CCC 1324). Sunday Mass is the foundation of the Christian life. Early Christians met every Sunday to honour Christ’s Resurrection (CCC 2174-78). This is where we receive Jesus, where we support each other spiritually, and are nourished from God’s Word. The homilies are our most important teaching tool as a community. This is where I explained the pro-life position with a testimony about God’s power to heal us after an abortion; this is where I taught you how to pray with spiritual journaling, explained the correct answer to why God should let us into heaven, three ways to increase our faith, two reasons why God allows us to suffer, etc. Jesus calls all of us to have a Eucharistic heart. From 2006 to at least 2017, an anonymous Benedictine monk wrote down all the words that Jesus spoke to him — what we call ‘locutions.’ In one locution Jesus said He was grieved that churches are locked, because it stops people from visiting Him, and He blamed the priests! He said, “I am your food… in this Sacrament of My love, but I am also your companion. 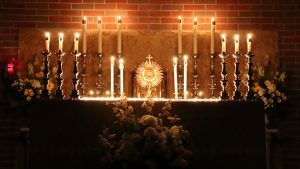 The Eucharist is the Sacrament of My divine friendship… I want the visit to the Blessed Sacrament to become once again a part of ordinary Catholic life, an instinct of the believing heart, and expression of gratitude and reparation to Me who am forsaken” (In Sinu Jesu, 55). 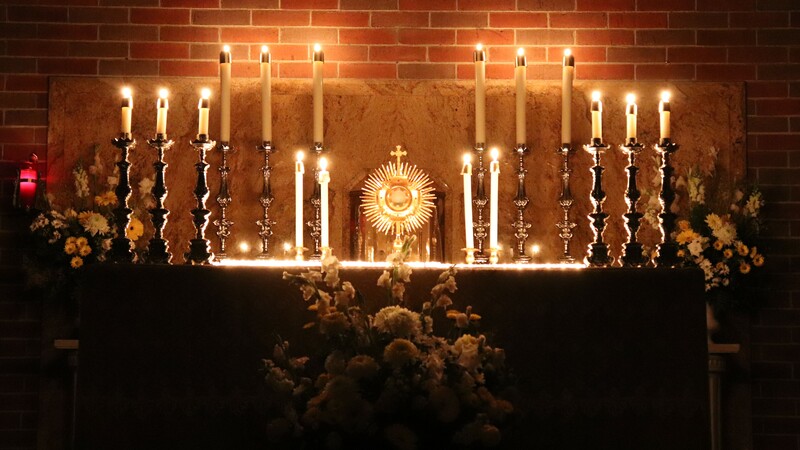 I’m continuing the invitation that we all commit to 15 minutes a week of adoration in the chapel, to respond to Jesus’ desire. 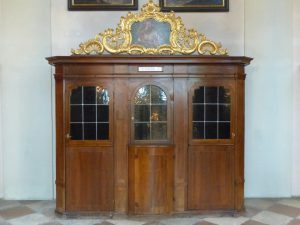 I don’t know if everyone can go to Confession weekly, but as we’ve said before, we do encourage monthly. That’s usually the amount of time it takes for our consciences to become dull. 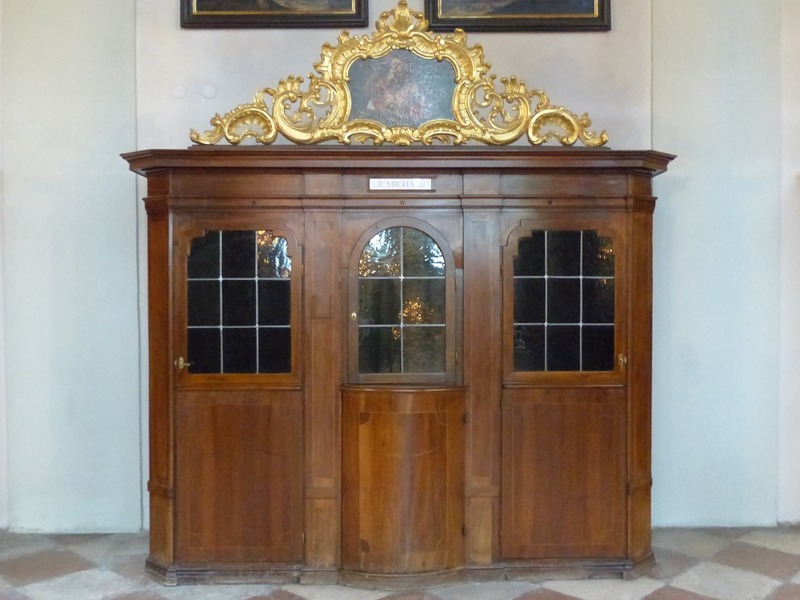 But monthly Confession renews and keeps us spiritually sharp. Fr. Pierre has been so generous lately by hearing Confessions whenever he can on Sundays. This is a sign that God’s offering more opportunities for Confession and He wants us to take advantage of them. 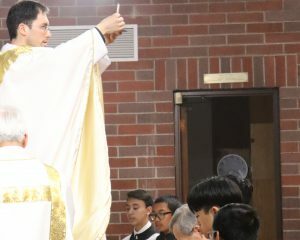 If we make Mass, Confession, and Eucharistic Adoration regular habits, then we won’t even have to think about them but just keep on growing deeper. It starts with Alpha for 12 weeks. Once someone experiences that, we encourage them to go to Faith Studies, where they go through five levels of further spiritual growth and training, for a total of 36 weeks. This course of studies takes us deeper into the Bible, and challenges us more, and gives us the foundation of being a disciple. After that, we do the Marian consecration, which teaches us a deeper form of prayer, introduces us to our Mother, because we can’t have Jesus as our brother without Mary as our mother. After that, Dexter, one of our parishioners, will start our Bible study, Journey Through Scripture, which has four levels of six weeks each. Eventually, we’ll need to expand the loop into pro-life training, Theology of the Body, apologetics, Dying Healed, etc. I’m so happy that one of our parishioners just started her Master of Arts in Theology in January 2019. She did everything we have here and so we encouraged her to go even deeper! But, here’s the thing, if someone starts with Alpha, God may call them right away to join the team and go through it again as a helper, so they loop back and help form others, and so the team grows. Or, if someone has the gifts to lead Faith Studies, they’ll be invited to lead and will loop back. This is one of the geniuses of the loop: It forms leaders; the best way to learn is to teach, and they keep on growing. Now let’s say someone started with Marian consecration, has led it, and keeps on looping by leading—great! But, eventually, this person should loop back to another program, not only to learn (because there’s always something to be learned), but to understand how to teach others. 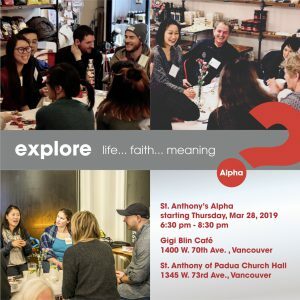 For example, Alpha isn’t just good to learn about the big issues of the Faith, but a place to experience authentic Christian community and how to share our faith in a winsome way with others. The genius of the loop is that it allows multiple entry points and allows us all to grow in stages. We’ll expand the loop as soon as we raise up more effective leaders; and every program has to be lay-led, and become self-sufficient, so that it can reproduce itself. 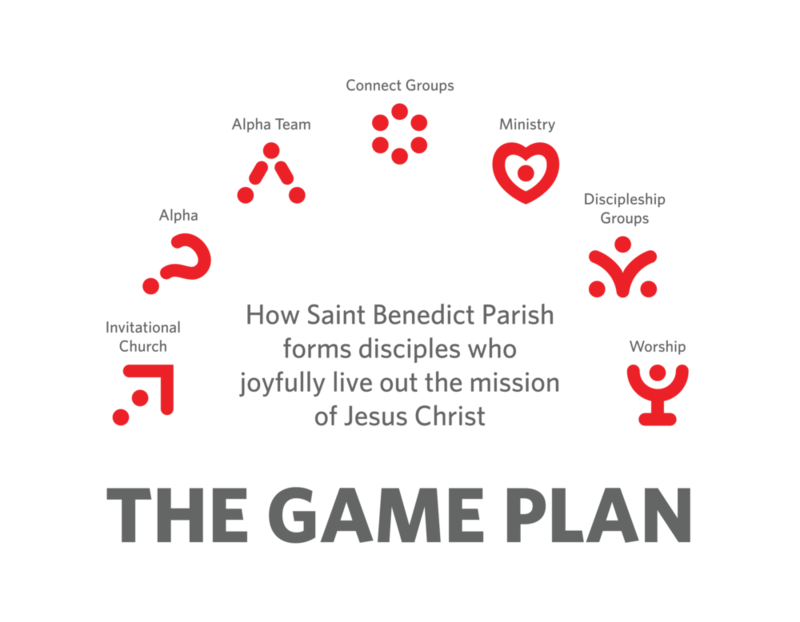 The best parishes in the world have plans like this. Ours is different from St. Benedict’s because we have different charisms and strengths. Alpha and Faith Studies are perhaps the best programs for parish spiritual growth in North America right now. Alpha’s starting again on March 28, 2019 and our leaders in red are at the back of the church in case anyone has questions. I’m inviting you to be a part of this plan, to grow and help others grow, because, as we’ve said many times before: If we’re not growing, we’re dying. Where can you grow in the Weekly Bread? 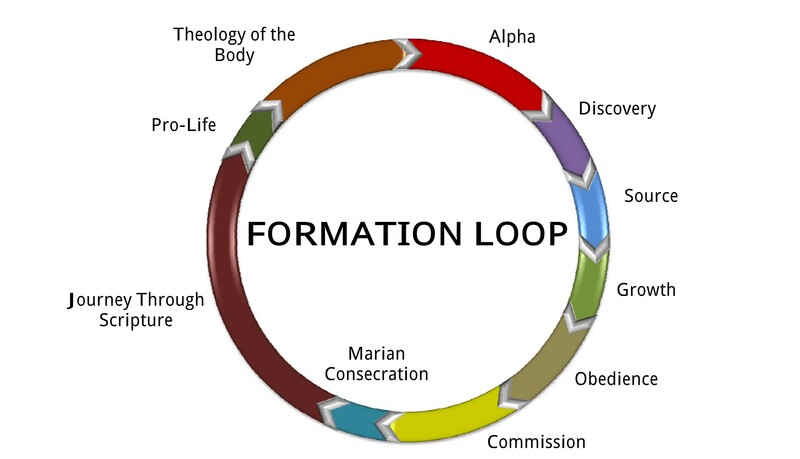 Where can you grow in the Formation Loop? 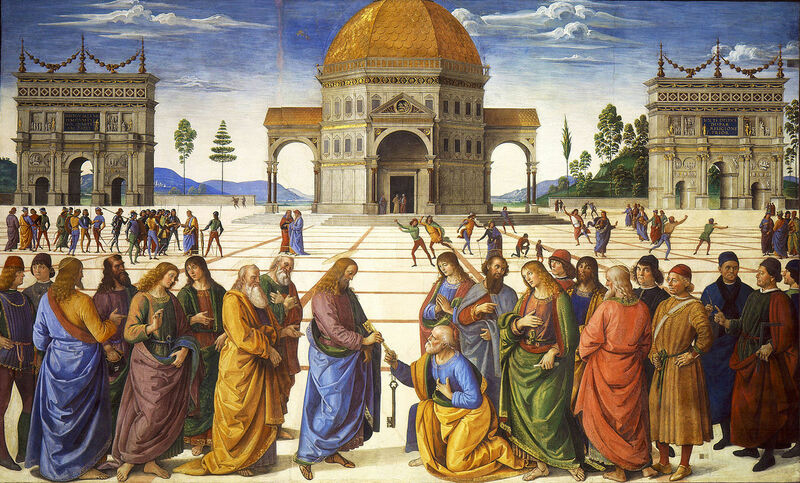 It all started with a “Yes.” When St. Peter said “Yes” to Jesus’ getting into his boat, he had no idea it would lead to a miraculous catch of fish, then to his becoming the first pope, and then to Rome, where the Church would change the world and become the sacrament of salvation for all peoples. It started with his courageous and generous “Yes,” and it was all part of Jesus’ plan.